Powers/Abilities: Phyla has superhuman strength (class 5-15). She can fire energy blasts and fly. She also acts like an "energy sponge," absorbing any energy attacks directed at her and returning them as energy blasts. She has cosmic awareness and is a proficient fighter. History: (Captain Marvel VI#18 (fb)) - When Captain Marvel was manipulated by the cosmic entities known as Entropy and Epiphany and helped them recreate the universe, the universe was remade with several differences. When the universe was recreated, so was everybody in it, including Captain Marvel himself. The Captain Marvel of this universe was the hero that the true Captain Marvel had always wanted to be, and his creation was such a success, that his mother, Elyisius, created another genetically engineered offspring, Phyla. (Captain Marvel VI#16) - As the insane Captain Marvel was headed for Titan, with Elysius and Eros on his trail, Elysius sent a message to Phyla telling her that her brother was coming and to be ready to fight him when he arrived on Titan. Phyla assured her mother that she could handle her brother. Elysius told Phyla that her brother had betrayed his responsibilities as Captain Marvel, and the title now belonged to Phyla. (Captain Marvel VI#17) - Phyla watched when Captain Marvel (Genis, not Phyla) arrived on Titan and saw that all the other Titans were out of phase, and existed a few seconds in the past or future. Captain Marvel reasoned that the Titans were afraid to face him. As Captain Marvel began to doubt his own perceptions of reality, Phyla made her presence known to her brother, whom became incredibly confused at her existence, remembering her, but feeling as if he shouldn't. Phyla began to bicker with her older brother, flaunting the fact that their mother had given her the title of Captain Marvel, and filling her brother's head with doubt. Captain Marvel then attacked Phyla, and the two began to fight. Phyla hit Captain Marvel with a couple of energy blasts. However, he seemed more annoyed by them than anything else. Phyla claimed to her older brother; that he was the first draft and he was a fluke, the one that made all the mistakes. Phyla claimed that she was the one with which their mother got it right. Captain Marvel then continued fighting with Phyla and eventually gained the upper hand. However, before Captain Marvel could badly injure his sister, several Titans, including Elysius and Eros intervened. In response, Captain Marvel opened a portal and Phyla, Eros, and Elysius were sucked into it. But at the last second, Phyla formed an energy lasso and pulled Captain Marvel into the portal with them. (Captain Marvel VI#18) - Now in a realm that had different physical laws and was truly not of this universe, the minds of Eros, and Elysius were able to overcome the less experienced mind of Captain Marvel and expel his insanity. 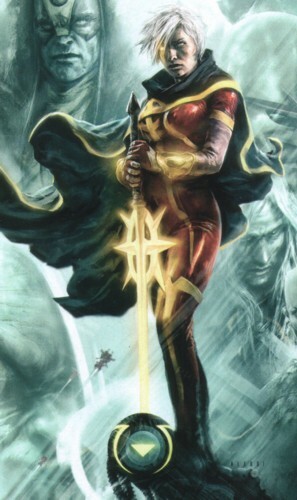 Phyla was there as well and helped defeat Captain Marvel as well, even though she did not contribute as much to Captain Marvel's defeat as Eros and Elysius. (Captain Marvel VI#19) - Phyla met with Rick Jones, who was molecularly bonded to Captain Marvel, in an office that Captain Marvel had set up for himself so that if anybody needed help they could call him. Phyla explained to Rick Jones and Captain Marvel that nobody was going to come to them for help because now the universe was terrified of Captain Marvel for the atrocities that he committed while he was insane. She also suggested that Captain Marvel cede the title to her, which Captain Marvel was not willing to do. Before the conversation could continue, they were interrupted by the arrival of an alternate super powered version of Marlo Jones, whom attacked Rick. Phyla attacked this alternate Marlo, and kicked her in the face, but was then promptly punched into orbit. Later on, while Captain Marvel was fighting the alternate Marlo, Phyla returned and fired an energy blast at her, but by that time, the alternate Marlo had deteriorated into nothing. (Captain Marvel VI#20) - While Captain Marvel traveled to the future to resolve the conflict with the future Marlo, he sent Phyla to the apartment of the Marlo Jones of Earth-616 and Moondragon to make sure they were safe in the present as well. Phyla introduced herself and explained why she was there in very little detail. (Captain Marvel VI#21) - Phyla inquired to Moondragon as to whether or not her and Marlo were "together." Moondragon responded that it was none of Phyla's business. Meanwhile, Marlo was attacked by the Magus in the bathroom and was being pulled through a portal in the mirror when Phyla burst in and shattered the mirror with an energy blast, saving Marlo. (Captain Marvel VI#22) - Phyla insisted that Marlo accompany her to Titan where she would be able to protect Marlo far better and more efficiently with Titanian science at her disposal. Marlo hesitantly agreed and left with Phyla for Titan. (Captain Marvel VI#23) - Phyla led Marlo into the main monitor room of their base on Titan, explaining what had happened with the alternate Marlo along the way, causing a great deal of shock and some mild fear in Marlo of Earth-616, as well as bickering with Marlo a bit. Phyla explained that from the monitor room, they would know if the Magus approached. Phyla used the technology of the monitor room to discover that the Magus was on Earth. She then observed the Magus attacking and badly injuring Moondragon through a view screen. Phyla tried to hold back Marlo, who was thrown into a fit of rage upon seeing Magus injure Moondragon. (Captain Marvel VI#24) - As Captain Marvel reentered the present day through a time portal, Phyla and Marlo assumed it would be the Magus coming through the portal, and Phyla prepared to fight and held the still enraged Marlo back. When Captain Marvel entered through the portal, Phyla noticed he was in great pain, and tried to get him to confide in her what was weighing so heavily on his mind. He refused to tell her. (She-Hulk II#12) - Phyla placed Starfox on the Judgment Chair on Titan. She stood by when the trial was supposed to begin, but the Magistrati appeared and demanded to bring their agent from Earth, She-Hulk to the trial because Starfox broke Earth's law. When She-Hulk arrived on Titan she called Phyla by her name, but Phyla wanted to be called Captain Marvel by She-Hulk. She stayed to observe the trial and together with Moondragon held back She-Hulk when she tried to attack Starfox and fought her until the unexpected arrival of Thanos. Phyla couldn't believe that he wasn't there to fight, but he didn't even know her and Phyla had to tell him that she was Captain Marvel. The trial continued and Phyla observed. (She-Hulk II#13) - Phyla and Moondragon had to hold back Mentor when he tried to attack Thanos after he revealed that Starfox made him love Death. Thanos was then placed on the Judgment Chair by Phyla to enable him to proof this claim and the trial continued. Phyla saw Thanos struggle, the arrival of Stargod and had to fight against Thanos once again before the trial ended with the revelation that this Thanos was just a clone and that the real Thanos had tempered with Starfox's mind. She was present when Starfox decided to give up his powers. (Annihilation: Conquest - Quasar#1 (fb) ) - On Titan Phyla ran an obstacle course faster than anyone before her, except her father. She proudly told it her mother, who had bad news for her -- Genis was killed because he wasn't as good as his father. Elysius told Phyla to run the obstacle course again because otherwise the same fate would await Phyla. (Annihilation#2 (fb) ) - Phyla visited alongside Moondragon the graves of Mar and Genis-Vell. There they were surprised by Thanos and Skreet. Thanos knocked Phyla out with an electrical blast, gave her Moondragon's ear and told her to give it Drax and tell him that Thanos had his daughter. (Annihilation#2) - Phyla traveled to Daedalus 3 to tell Drax that his daughter Moondragon was abducted by Thanos. She gave Moondragon's ear and earring to Drax. Phyla wanted to free Moondragon, but Drax wanted to do it himself. (Annihilatoin#3) - Phyla escaped along with Nova and other warriors from Daedalus 3 when the Annihilation Wave attacked. (Annihilation#4) - Gamora brought Phyla, Nova, and Quill to the Xandar Cluster from where Nova teleported them to the Annihilation Wave's current location. (Annihilation#5) - On Canticus Prime Phyla, Nova and Quill met with Blastarr and the Spaceknights. Blastaar recognized Phyla as Mar-Vell's daughter when he gave Nova's team coordinates that would send them withing striking distance of Annihilus' flagship. Nova then teleported with Phyla and Quill away. (Annihilation#6) - Nova, Phyla and Quill rematerialized near Annihilus' flagship and witnessed Galactus' attack on Annihilus' fleet. Nova created a force bubble around himself and his mates to protect them from the force that tore apart Annihilus' ships. Trapped within the bubble Phyla and Quill then watched Nova fight Annihilus alone. Phyla broke free when Nova was near defeat and tackled Annihilus. She touched the Quantum Bands Annihilus had taken from Quasar and they left Annihilus for Phyla. She attacked Annihilus, but he was still too powerful for her. Seconds after she was blasted by Annihilus he was killed by Nova. Phyla and Quill then brought Nova, who was seriously injured, to safety. The following weeks Phyla began to think about becoming the new Quasar although Moondragon was against it. (Annihilation: Conquest - Prologue (fb) - BTS) - With Moondragon at her side Phyla began her career as Quasar. (Annihilation: Conquest - Prologue) - Quasar and Moondragon protected Priests of Pama from scavengers on the Lamentis Outworld at the edge of Kree space. During the fight Phyla was distracted by a voice and Moondragon had to save her from an axe wielding villain. After the fight Phyla asked the Priest Om-Fad to give the scavengers what they wanted to show them that violence is no solution. 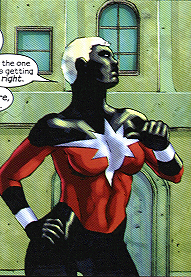 Inside the devastated temple Phyla told Moondragon that she didn't feel to be good enough to be Quasar. That night inside the temple Phyla heard the voice talking to her again and realized that the voice came from the Quantum Bands. It warned her from a coming disaster and told her to find the savior of the Kree. When Moondragon informed Phyla about strange reports from Hala and other Kree heartworlds, Phyla told her about the warning. The next moment they were attacked by a Kree Sentry already under Phalanx control. Phyla blew it up and the voice from the Quantum Bands told her that time was running out. A short time later Phyla and Moondragon saw the sky lighted up by a massive energy pulse coming from Hala. Phyla flew to Hala and on her way there she found a destroyed superlight liner and after that a barrier formed by the energy pulse. She tried to get through the barrier, but soon felt that Kree space was shifted out of phase by with the rest of the galaxy and that she couldn't get in. Again the voice talked to her and told her to find the savior and she promised that she would. (Annihilation: Conquest - Quasar#1) - At the fringe of the Kree Empire the ship of Quasar and Moondragon was attacked by Phalanx warriors. Quasar defeated them and was then attacked by the Phalanx select Super-Adaptoid. She was able to escape him, but during the fight one of the Quantum Band jewels went dark. 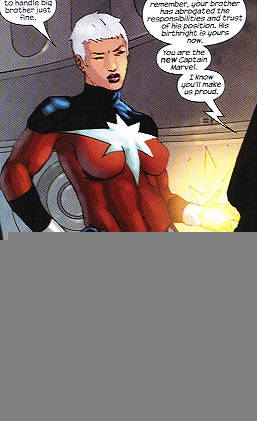 Quasar contacted Moondragon mentally and then met her and a group of Priest of Pama on a nearby planet. A priest, a Cotati and Moondragon helped Phyla find the savior of the Kree. Phyla and Moondragon rested together that night, but in the morning the planet was attacked by the Phalanx and the Super-Adaptoid. Quasar and Moondragon fought them, but couldn't save any of the Priests of Pama. (Annihilation: Conquest - Quasar#2) - On their way to the savior, Quasar and Moondragon were attacked by a Brood above the planet Dlaw-Neurg. During the fight Quasar lost control over herself again for a few seconds. Down on the planet they followed the savior's energy signature and found a ship. In short manner Quasar got rid of a giant insectoid inside the ship, but they soon had other problems. Super-Adaptoid and the Phalanx had found them. The Super-Adaptoid copied Phyla's Quantum Bands and then followed the savior's energy signature himself. Meanwhile Quasar and Moondragon fought the Phalanx warriors. Quasar saw Moondragon overpowered, but before she could aid her, Moondragon released the power of the Dragon of the Moon inside her and became a dragon herself. 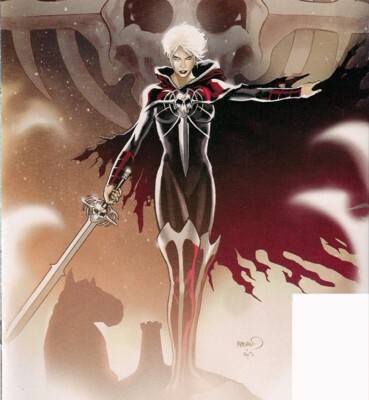 (Annihilation: Conquest - Quasar#3) - They defeated the Phalanx warriors and then, following the savior's energy signature, flew to the planet Morag IV (Terma). In front of a citadel the Super-Adaptoid knocked them out. Quasar reawakened in a primitive village, whose people had found her and Moondragon. Quasar told the people to leave this place before she left the village. Quasar flew on Moondragon's back to the citadel. They killed another monstrous guardian before finding the cocoon with the savior. Super-Adaptoid was already there and had infected the cocoon with the transmode virus, but Quasar and Moondragon still fought him until he told them that the Phalanx were going to kill all peple on the planet because they had helped Quasar. Moondragon and Quasar left the citadel to help the people of Morag IV and Quasar used up all the Quantum Band energy she had left to destroy countless Phalanx warriors with one single attack. (Annihilation: Conquest - Quasar#4) - Quasar and Moondragon were joined by Dejann and his warriors against more Phalanx warriors on their way to the citadel. Inside the citadel she attacked Super-Adaptoid, who used Quasar's own quantum energy against her. She absorbed it to reload the Quantum Bands a little bit and then defeated Super-Adaptoid. After absorbing more quantum energy from the fallen Super-Adaptoid, Phyla entered the evil left in the Quantum Bands by Annihilus with the help of the Wendell Vaughn's spirit. When the evil was gone, Quasar returned to the fight outside, trapped all Phalanx warriors on the planet in an energy bubble and tossed them into the local sun. Moondragon and Quasar freed the cocoon of the Phalanx machinery. The Supreme Intelligence appeared to reveal that it had led Quasar to this place (the voice in Phyla's head) to help him reawaken the savior because they couldn't wait until he woke up on his own. Quasar, Moondragon and the Supreme Intelligence opened the cocoon and inside was Adam Warlock. (Annihilation: Conquest#1) - Quasar explained to Adam how the Phalanx had conquered Kree space and that they needed his help against them, but Warlock couldn't even remember who he was. While Adam transformed himself using his new powers, the trio was surrounded by Phalanx warriors and the Select Korath, Xemnu and Shatterax. Adam trapped himself, Quasar and Moondragon inside an energy globe and fled the fight. He brough them to his father, the High Evolutionary, who had a refuge in the nearby sun. (Annihilation: Conquest#2) - Quasar explained the whole situation with the Phalanx and how the Supreme Intelligence sent her to free Adam Warlock, who was the supposed savior of the Kree empire. The High Evolutionary in return told her that he was in Kree space because the Supreme Intelligence had hired him to remake the Kree race. He was now able to create warriors able to resist the Phalanx, but before he could talk more about it, the refuge was attacked by the Phalanx and their new leader Ultron, who immediately killed Moondragon when she tried to protect her beloved Phyla. (Annihilation: Conquest#3) - Quasar left the fight to Adam and brought the dying Moondragon to safety. She returned to the fight after Moondragon's death and drained once again all the energy of the Quantum Bands. Meanwhile the High Evoluationary had initiated a terminal reaction in the star surrounding the refuge to stop Ultron. The star and the refuge exploded. (Annihilation: Conquest#4) - Adam Warlock had saved the High Evolutionary and Quasar inside an energy bubble and brought them to Hala, but before they arrived Adam Warlock lost control of his powers. The energy bubble vanished and the trio dropped helplessly down towards the planet. Adam saved Quasar from the deadly fall. On the planet's surface they were soon detected by the Phalanx, who couldn't stop them from finding the bunker, where the Supreme Intelligence's Nu-Kree warriors were created. The High Evolutionary was already there, but he betrayed them to the Phalanx. (Annihilation: Conquest#5) - As a Phalanx captive, Quasar watched at High Evolutionary's side the memories of Ultron, which led to him becoming the Phalanx leader. Quasar couldn't believe that the High Evolutioanry had killed Adam, but he corrected her on this because Adam wasn't dead. Quasar helplessly watched as Ultron's mind was transferred into the body of Adam Warlock. Ultron reawakened in his new body and immediately shot Quasar. (Annihilation: Conquest#6) - When Quasar regained consciousness she saw the spirit of Moondragon (it was just what Phyla wanted to see) in front of her. It explained to her that Adam's soul had fled into the Quantum Bands and that Quasar had to help the Kree and Adam now. Quasar returned Adam's soul to his body, when Ultron had left it because the alien Warlock was going to infact him with his mutated version of the transmode virus. Quasar joined Adam, Nova and the Technarch Warlock in their fight against the Phalanx. When Ultron built him a giant body with Kree Sentries, Quasar absorbed Adam Warlock's energy with the Quantum Bands. Wraith trapped Ultron's mind in his giant form and Quasar used her energy sword to destroy Ultron. Without Ultron's mind the Phalanx was deactivated. (Guardians of the Galaxy II#1 (fb) ) - One day after the end of the Phalanx conquest Quasar met with Nova and Quill to talk about future plans. Quill suggested to create a proactive team to prevent future attacks on the galaxy. (Annihilation: Conquest#6) - After the end of the Phalanx conquest Quasar stayed with her new allies. She wrote a letter to her dead girlfriend Moondragon about what had happened since the end of the conquest. Adam entered her room to tell her that Peter Quill wanted to see them both. Adam also revealed to Phyla that he finally knew why he had been given his new powers. Before the meeting Phyla finished the letter and delivered it to Moondragon's grave. (Guardians of the Galaxy II#1 (fb) ) - Quasar met Drax at Moondragon's grave and she offered him a new purpose in his life (to join Quill's team). (Guardians of the Galaxy II#1) - The Guardians of the Galaxy attacked the Universal Church of Truth's templeship Tancred to stop them from entering a fissure. The Guardians were shocked when the Church's higher-ups teleported to safety, leaving their followers behind to die. After entering the fissure the Guardians were attacked by an extradimensional monster, but they were able to hold it back until Rocket Raccoon blew up the ship's font. The team then teleported back to their base on Knowhere. Adam Warlock found another fissure. (Guardians of the Galaxy II#2) - The Guardians teleported onto an icy landmass that came through a disturbance near the star SG Hydronis. They encountered monstrous beings and Major Victory from the future. He joined them in fighting the monsters. They took Major Victory with them to Knowhere after blowing up the monsters and the icy landmass from the future. After the mission Phyla went shopping on Knowhere. (Guardians of the Galaxy II#4) - Quasar and Adam Warlock arrived at Knowhere's sickbay to learn that some of the victims of the explosion that nearly killed their teammates where Skrulls. Before the team could begin their search for more Skrull infiltrators, the Guardians were confronted by Gorani and Cynosure, who weren't happy about the Guardians of the Galaxy making Knowhere their base of operations or that they acted like they ran Knowhere. The Guardians were put under house arrest by Cosmo after a fight between Major Victory and a few aliens. Star-Lord and Phyla were later interrogated by Knowhere's council about their teammates and they had to defend Drax. (Guardians of the Galaxy II#5) - Quasar couldn't believe that the council thought Drax was a Skrull saboteur. After Drax had defeated a team of Luminals Quasar left the Guardians' quarters to search for him. She found him placing synaptic disruptor charges on Knowhere. When she realized that he wanted to kill everybody on Knowhere to learn who were Skrulls it was too late to stop him. (Guardians of the Galaxy II#6) - Quasar was temporarily killed by Drax's synaptic disruptor charges. Alive again after Drax had deactivated the charges she angrily attacked him until he showed her that he had found the Skrulls. Quasar and Drax went to the Skrulls, who were protected by Cosmo and Adam Warlock because they were not the saboteurs, but the ones that were hunted by the Skrull saboteurs. The rest of the Guardians soon joined Quasar to fight off the Luminals, who tried to kill the Skrulls as well. While Star-Lord had to justify his teams' actions, Drax told the other Guardians that Star-Lord made Mantis manipulate them to join the Guardians of the Galaxy. The team broke apart and Quasar left with Drax. (Guardians of the Galaxy II#7) - Quasar joined Drax on his search for Cammi. On a distant planet a fortune-teller told them that they had to go on a painful quest to find -- Heather (Moondragon). Quasar and Drax were surprised. (Guardians of the Galaxy II#9) - Quasar and Drax went to Titan to tell Mentor what they had learned about Moondragon. He killed them. (Guardians of the Galaxy II#11) - Phyla woke up in Oblivion's realm and was abandoned by the Quantum Bands. Drax saved her from manifestations of her fears and doubts and then wandered with her through the realm until they were attacked by Maelstrom. They defeated him and learned that he had lured them to Oblivion with Moondragon's life essence. He led them to the Dragon of the Moon wherein Moondragon was imprisoned. Suddenly Maelstrom was in possession of the Quantum Bands and overpowered Phyla and Drax. He offered them to the Dragon if the Dragon in return used its powers to get Maelstrom out of Oblivion's realm. (Guardians of the Galaxy II#12) - Maelstrom dropped Phyla into the Dragon's mouth. Inside the Dragon Phyla made a deal to become Oblivion's new avatar of Death. With her new powers as Martyr she burst with Moondragon in her arm through the Dragon's gut. Moments later she awoke on Titan at Drax's side. Though she was angry at Mentor she was happy to be reunited with Moondragon, who had been reborn into a Titan-cloned body. Phyla didn't tell Moondragon what she had done to save her. Comments: Created by Peter David, Paul Azaceta, and Chris Sotomoyer. In case you didn't get Peter David's little joke, Phyla was a play on Genis' name. Playing on the name Genis' similarity to Genus, he used the feminine version of Phylum. In Annihilation: Conquest - Quasar#3 the planet where Adam Warlock was later reawakened was called Morag IV. In Annihilation: Conquest#1 it was called Terma. It seems like one hand wasn't talking with the other. Despite this snafu Annihilation: Conquest still rocked! Profile by Stunner. Updated by Markus Raymond.